Weingut Robert Weil, Kiedrich is a member of Wein‑Plus and thus supports this wine guide. Thank you! By creating Weingut Robert Weil saved filter, you will see relevant matches on your home screen. 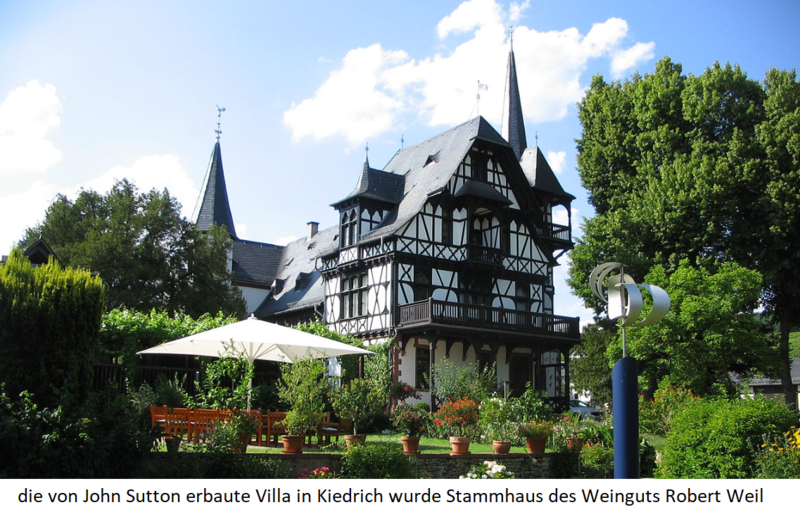 The estate is located in the municipality of Kiedrich in the German wine-growing region Rheingau and was founded in 1875 by Dr. Robert Weil (1843-1933) founded. There are also family roots in the well-known Bernkasteler wine dynasty Prüm, By purchasing the two wineries Nilken and Bushman, the villa of the noble English patron Sir John Sutton (1820-1873) shown in the picture, which became the parent house, as well as vineyards from the possession of the Count of Fürstenberg, the estate was considerably expanded. A Riesling of the vintage 1893 from the location Gräfenberg made the winery widely famous. The selection from the Kiedricher Berg was then delivered to many imperial and royal houses in Europe. In 1900, for example, the Viennese Hofwirtschaftsamt bought 800 bottles of this wine for the Habsburg imperial court for a price of 16 gold marks. By the way, in the treasury from the house the top wines of the great vintages are stored back to that legendary selection. The vintage 1920 of the Kiedricher Gräfenberg Trockenbeerenauslese is called Zeppelin wine because he was on board the airship "Graf Zeppelin LZ 127" during the circumnavigation of the world in 1929. In 1988, the Japanese beverage company acquired Suntory a majority stake in the estate. It is today run by the fourth generation of the family by the founding grandson Wilhelm Weil (estate director, oenologist). For the vineyards Clemens Schmitt and Philipp Bicking are responsible for the cellar Christian Engel and Fabian Kretschmer. The vineyards cover 90 hectares in the VDP-classified Kiedricher single layers Gräfenberg, Klosterberg and (in sole ownership) Turmberg and others. You are 100% with the variety Riesling planted, on which the company specializes. Among the quality-enhancing measures in the vineyard include greening, exclusively organic fertilization, Pest control with biodegradable, environmentally friendly means, as well as complete abandonment of herbicides, Other quality factors are yield restriction by restrictive bleed, twofold thin out, early negative selection and extremely selective grape harvesting, usually not before the beginning of November. The time-consuming harvest often takes eight to ten weeks with multiple reads. When harvesting the noble-rotten grapes, the harvesters sort these already separately after three rottenness levels. In the cellar, the grapes are read again berry for berry. The clarification of musts is done by natural sedimentation, The six to twelve weeks fermentation is temperature controlled in stainless steel tanks and in the traditional Rheingau piece barrel, At the reductive expansion will be as long as possible contact with the used. 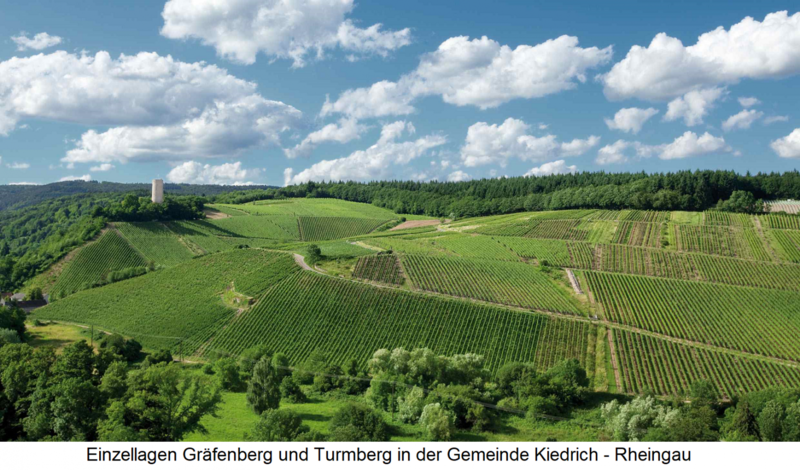 The marketing takes place according to the VDP classification model as Gutsweine (Robert Weil), Ortsweine (Kiedricher areas), Erste Lagen (Klosterberg and Turmberg) and from the Great Location as Big plants (Graefenberg). Traditionally, the noble sweet wines of choice to Trockenbeerenauslese to the top products of the house. You will be with a gold capsule marked and auctioned at auctions at the highest prices. The winery is a member of VDP (Verband deutscher Prädikatsweingüter).